I can’t believe we are just a few short days away from celebrating Christmas, especially since there’s still so much to do before the big day! Even though we haven’t opened any gifts or spent time with family just yet, I find myself already thinking ahead to the new year and all the potential it has to offer. Wait. I should back up a little. I’m actually thinking ahead to New Year’s Eve and how much I’m looking forward to a quiet night at home with my family playing board games, eating snacks, and waiting to watch the ball drop on television. That’s pretty much what we did last year and it was so much fun, but I think the toughest thing might be agreeing on which board game(s) to play since we have so many on our shelves. This year, though, my friends at Wonder Forge sent me one that is right up my family’s alley, and maybe yours too! I’m pretty sure I’ve shared maybe once or twice that my everyone in my family is a huge fan of all things Disney. Disney parks, Disney movies, and Disney games are things that bring us a great deal of joy and happiness, so when I heard about Wonder Forge’s new game Pictopia: Disney Edition I knew immediately that we needed to play it. Families team up in this uniquely collaborative yet competitive trivia game with 1,000 questions covering the World of Disney! During the game, everyone gets a chance to show off their knowledge – from Disney Jr. and Disney XD to the Disney Parks and classic films. Players place wagers based on knowledge of those images, and then work together or on their own, to answer the question. Players take turns being the host and asking the question. Other players will wager based on how well they know the images on the card shown to them. Sometimes you’ll have to answer questions all on your own, and other times you’ll work as a team to answer correctly! Answer questions correctly to advance your mover and get to the castle space first to win! 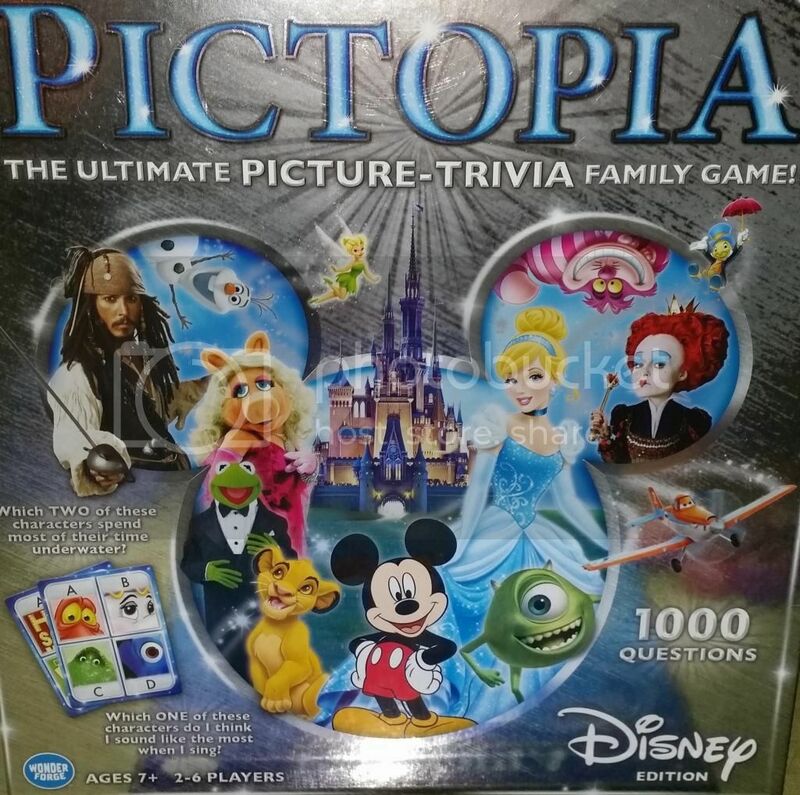 While the Pictopia Disney Board Game is recommended for ages 7 and up we have an added challenge in our family because many games are too difficult for Cody to play, so even though it sounded like something he could understand I tried not have high expectations. When it arrived I read through the instructions and decided that by making just a couple minor adjustments we could all play Pictopia together, including Cody! The first thing I did was take out the wagering aspect of the game, which is something you could also do if there are younger children in your family who can’t understand that concept, but still want to play the game with everyone else. It’s a pretty tricky one for Cody, so we just skipped that step and the game was still fun for everyone. Our family of four consists of my husband, Cody (20, with autism), Nick (16), and me and while many of the questions were really simple, others definitely stumped us or at least made us think for a minute or two. It’s a game for the entire family regardless of age or special needs. The answer cards include photos, which is especially helpful with small kids and those with special needs like Cody. There’s a good balance of easy questions and more challenging ones. One of my favorites was about the Magic Kingdom Park at Walt Disney World that asked which two attractions you’d come to first if you went to your right when entering the park. Since we consider Walt Disney World our second ‘home’ this was one we all knew immediately. The bottom line for me is that this game is a huge winner for my family because it’s one we can all play as a family while testing our Disney knowledge, which is why I’m excited to offer you a chance to win your very own copy of this fun picture-trivia family game from Wonder Forge! If you’re an avid Disney fan like we all are then you are going to want this game in your family’s collection, so I’m going to make this a super simple giveaway. Good Luck! The name of your favorite Disney movie. The name of your favorite Disney attraction/ride. The name of your favorite Disney character. The name of your favorite Disney theme park. Okay, so let’s recap. That’s FOUR total entries for a chance to win your own copy of the Pictopia Disney Board Game, but hurry because this giveaway is a quick one and will end on Friday December 26th at Noon (EST) sharp! I’ll use Random.org to choose a winner and they will be contacted via email. One last time……don’t be late for this very important date and good luck! Disclosure: I was a provided a copy of the game for the sake of this review, but as always opinions and thoughts are my own. Prize will be provided and shipped to winner by Wonder Forge. My favorite Disney attraction/ride is Space Mountain! My favorite Disney move is Dumbo. My favorite Disney character is Pluto. My favorite Disney Ride/Attraction is – It’s a Small World. My favorite Disney theme park is Epcot Center in FL. DisneyLand Paris is my favorite theme park. Minnie Mouse has always been my favorite character since i was a kid. Mary Poppins is my favorite Disney movie! Too many favorites, but Space Mountain is our top favorite ride/attraction. My favorite Disney movie is probably The Little Mermaid. I love the pirates of the Caribbean ride! I’ve only ever been to Disney Land but I’d love to go to Disney World one day! we love all things Disney. This would be the perfect family game. This looks like a great game – we are big Disney fans, definitely looks like a fun family friendly game. 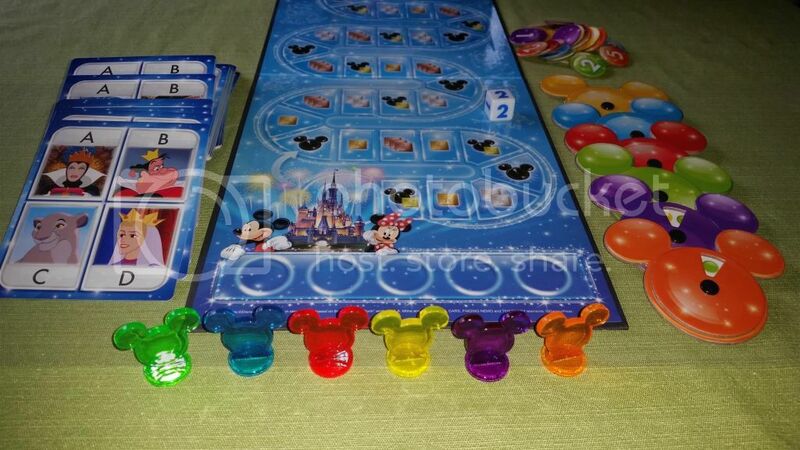 Not only is it a really great game for Disney fans, but also because it’s truly for everyone in the family regardless of their level of ability. I have this game, too, and the whole family loved it! I like the variety of questions – film, tv, attractions, etc. Very good for the Disney nuts. I love meeting other Disney fans like just like me (and my family)! Yes! My favorite thing about this game is that the questions cover ALL things Disney.